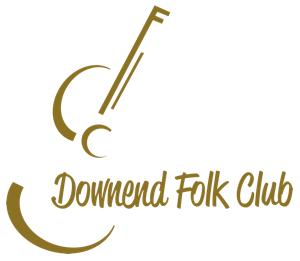 Downend Folk Club - REVIEW: "DUO ARE DELIGHTFULLY IN TUNE WITH ONE ANOTHER"
REVIEW: "DUO ARE DELIGHTFULLY IN TUNE WITH ONE ANOTHER"
What do you do on a Friday night? Fish & Chips? A glass of wine? Rubbish telly? If you spend it propped in front of music documentaries coughed up by BBC4 you might be inclined to believe certain things. You might believe that British Country Music starts and ends with The Shires or Ward Thomas. You might believe that British Country yearns for Nashville Grey Skies, that everything is shiny and freshly Radio 2 minted. You would never have heard of UK Americana pioneers The Arlenes, The Rockingbirds or Grand Drive. You would certainly never heard of THE BLACK FEATHERS; an English Americana duo from Gloucestershire. And, if you did spend those precious Friday nights drooling in front of your idiot lantern, you certainly missed them at Downend Folk Club. Believe me, you missed so much. See, The Black Feathers have played at the club before and went down a storm. On that night their emotional Americana sat slightly at odds when supporting the very folk-y Maz O’Connor. They are back by popular demand. “No pressure then”, singer Sian Chandler wryly mutters. It turned out that there was no need to feel any pressure. In the opening seconds of the first song the husband and wife duo prove that they are delightfully in tune with one another. An acapella intro gives way to a proper country beauty. Sure, there’s a chorus that Steve Wright could hum along to but there’s space too. And confidence honed by playing together all of the time. Any other band would treat ‘Homesick’ as a precious jewel to be held back until the end. We are treated to it by song three. It’s so slick, so perfect and sums up a longing for home and the need to return to those open spaces. Her voice magical and swooping, his classy and high in 70s-James-Taylor style. By the fourth song it’s becoming obvious that The Black Feathers deal in English Spirituals and the audience accept every blessing with a pin-drop reverence. ‘Holy Water’ might be about recovering from addiction but it’s all redemption and restraint. To follow it with a slowed and stretched version of ‘Spirit in the Sky’ only confirms that these two really do have a friend in Jesus. If we didn’t believe in them before, we believe now. It’s the restraint that holds the breath of the audience. Sian’s voice is sometimes too polite as though she understands that fully unleashing it could topple mountains. For all the fancy guitar contraptions that Ray Hughes has for his guitar it’s a thing of simplicity too. No loops or silly fills just great tunes deftly played. So, it’s not folk. The Black Feathers are definitely country. They almost apologise a couple of times but there’s surely no need. Certainly not when songs of such unalterable beauty, such magnificent pop class, as ‘All For You’ or ‘Goodbye Tomorrow’ roll by. And then there are the covers; there’s the ubiquitous folk-ish Dylan one, of course (‘Make You Feel My Love’, just so as you know) but the one that teaches this Folk audience something new is the magnificent ‘New South Wales’, a song by Jason Isbell. His original is a wonderful thing, this one its equal. Add to that a joyous, fully acoustic version of ‘Big Yellow Taxi’, complete with enthusiastic audience sing-along, and you have a country band utterly stealing folk-y hearts. Before this breath of fresh country air was a support slot from SASKIA. She is a much more recognisable proposition with names like Baez and Mitchell bandied about before her five song set. Add a Dylan cover and ‘Who Knows Where the Time Goes’ and we’re on pretty safe ground. It was all rather lovely though and set the evening up beautifully. Downend Folk Club turned three years old with this show. If you haven’t found a place for it in your Friday ritual yet you simply must. Become a believer.